The sizing chart below is a useful guideline to help to determine a space’s approximate HEATING load size requirements. 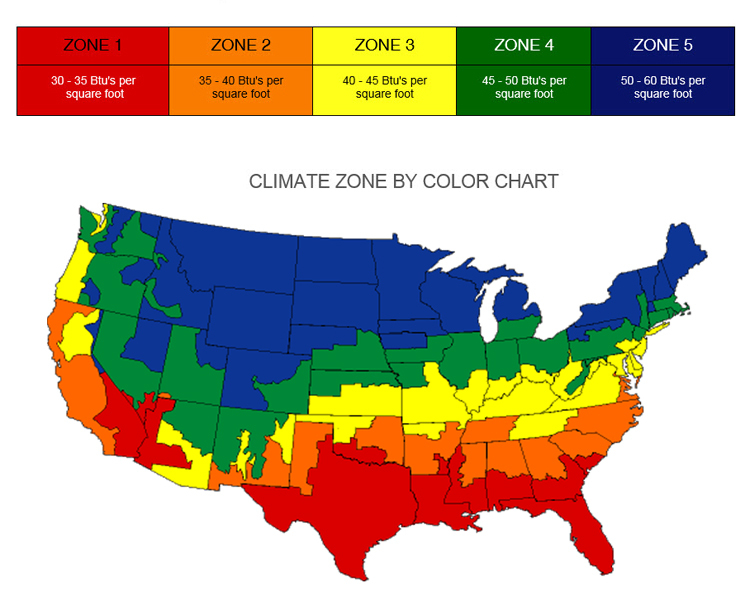 PLEASE SEE THE COLOR CLIMATE MAP BELOW TO I.D. YOUR ZONE. Variables such as your insulation, type and number of windows, number of stories, construction type, etc. will greatly affect the required Btu's per square for heating. A general rule of thumb is that if the space’s is well insulated with newer style windows, it can select the smaller size system that falls within the total square footage. If the space is a two story structure it will place less of a load on the system in the first floor area as the second floor acts as additional insulation. If your structure is not well insulated, has older style windows, and/or a larger than average number of windows, it will require the larger system which falls within the structure’s square footage range. The less insulated and more windows within the environment, the more likely the space will experience greater air and heat loss. Another key factor is the positioning or placement of the unit in the space itself. The unit’s air flow distribution, the supply and return airflow path will greatly affect the unit's overall performance to heat the space. Remember this sizing guideline for the BTU load requirements of a space is to be used as an estimate aid only. We recommend you use a Full Load Calculation for a more detailed assessment of your system requirements for that structure. Please note: As a wholesaler, we understand that whether you are a contractor, building owner, management company or a homeowner, this is a large investment. If you are unsure of your sizing requirements, please feel free to contact our customer service dept. by calling 1-800-414-8575 or emailing us at info@libertywholesalegroup.com. We will be happy to assist you with your selection.